Getting a handle on your personal finances isn't easy—bills, accounts, credit cards, and budgets are spread across dozens of different banks and services, making it difficult to stay on top of your money. 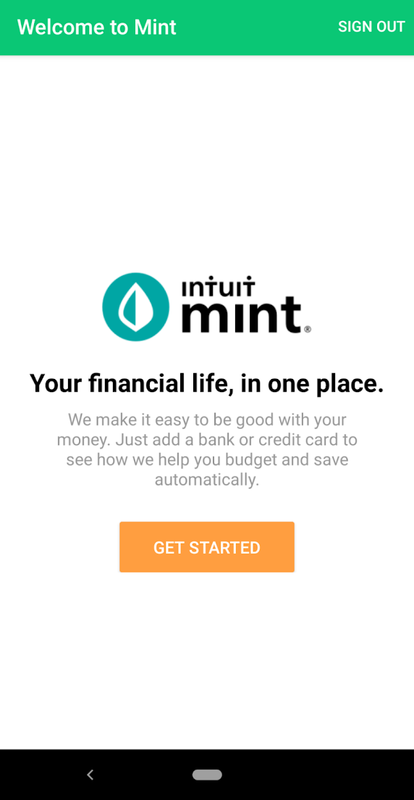 Intuit's personal finance service Mint (desktop, iOS, Android) brings all your financial info together in one place, helping you make sense of your cents. 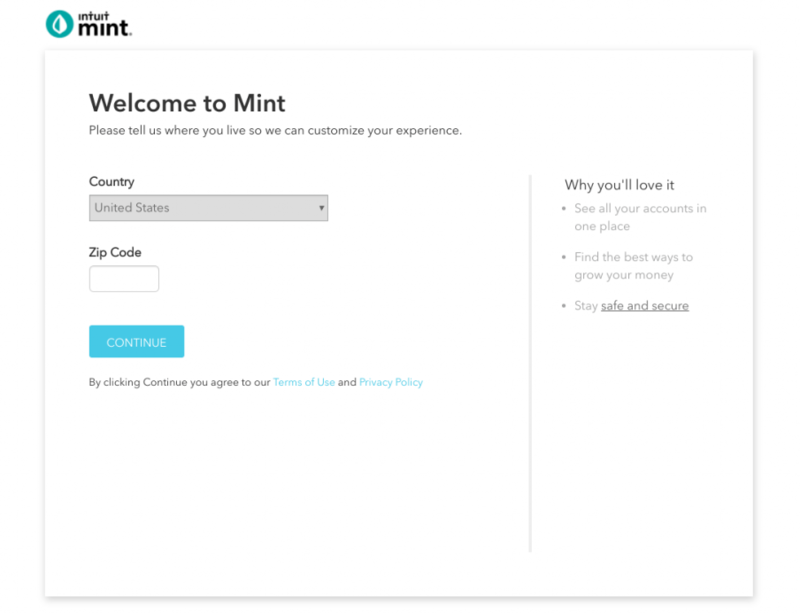 In their web app, Mint's onboarding process begins with a simple customization question—users are asked to select their country and input their zip code—alongside a nice little bit of trust-building copy that reiterates the main value proposition. 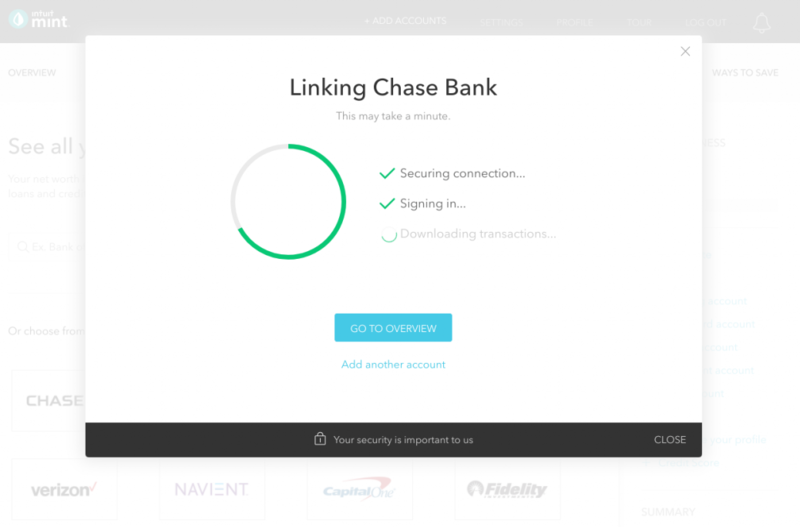 While users wait for Mint to connect a bank account, an animated loading screen keeps them updated on what's going on in the background. Waiting is never fun, but loading pages like Mint's make it a little more bearable. After adding their first account, a modal dialog appears inviting users to take a tour of the app. Each step in the comprehensive tour includes a tooltip teaching users how to use each feature. The copy in each tooltip focuses more on benefits than features, teaching users how that feature will help them improve their financial health. The dark background and vivid blue CTA buttons help the tooltips stand out from the rest of the UI. Each tooltip also includes a direct link to set up the feature, helping users get value from that feature faster. 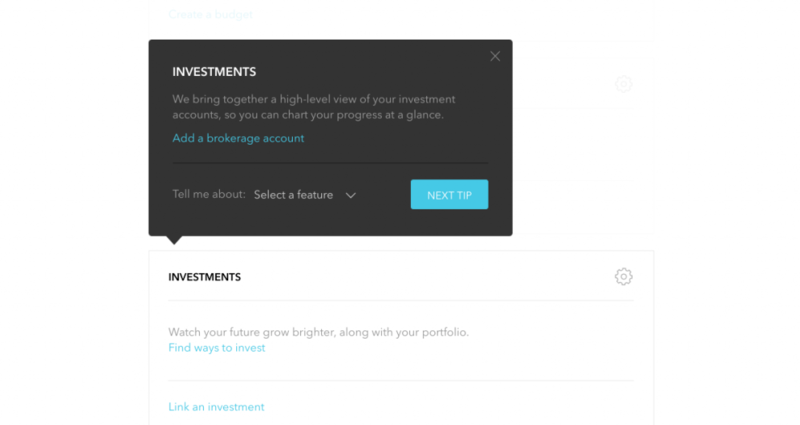 For example, in the tooltips below, users can click the included link to quickly add a brokerage account or see how their finances compare to others. Each tooltip includes a subtle animation and appears to float up and down slightly. It's a nice touch and serves to make the whole experience feel a little friendlier. Each time the user clicks on the Next Tip button, the page scrolls to the next feature in the tour. The scrolling helps build navigational awareness, teaching users where each feature can be found in relation to the others and making sure they can find each feature again once the tour is complete. The tour is long, so Mint includes a link in their top nav menu, making it easy for users to pick the tour back up if they exit before finishing, or revisit specific steps through a drop-down menu. These extra navigational options keep users in control of their own education, and make sure that contextual help is always available. 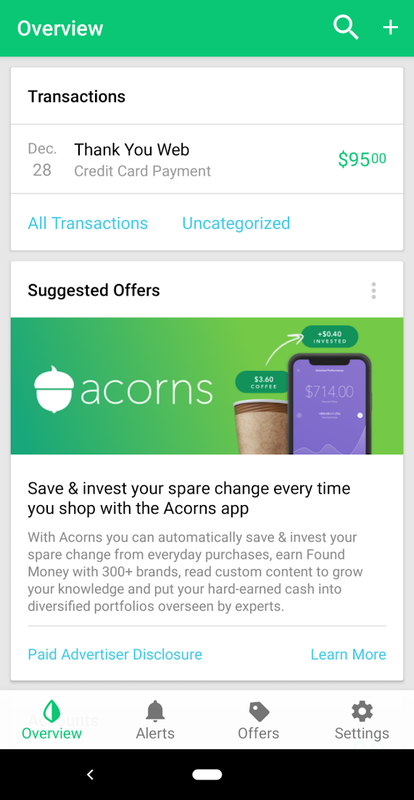 Mint offers both desktop and mobile versions of their app, and the onboarding experience adapts well to mobile with one glaring exception, which we'll get to in a minute. The welcome screen matches the feel of the desktop app, and includes a few short lines of copy that reiterate the product's core value proposition, with a single CTA. Unfortunately, we couldn't screenshot some of the mobile account setup flow due to the native screenshot security built into the app (kudos to Mint for adding that extra layer of security). Take our word for it: The flow nearly mirrors the desktop version. 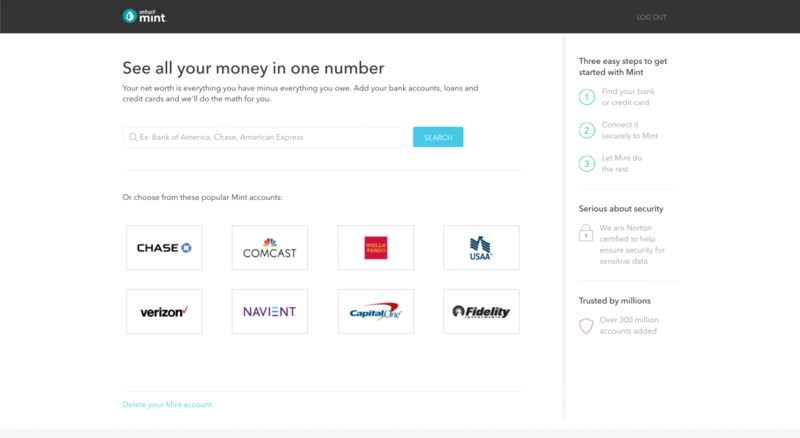 But after the app finishes connecting the first bank account, users are dumped straight into the app. There's no tour, no tooltips, and nothing to guide users on what they should do next. In fact, more than half of the very first screen is dedicated to advertising—overall, not the best experience for new users. 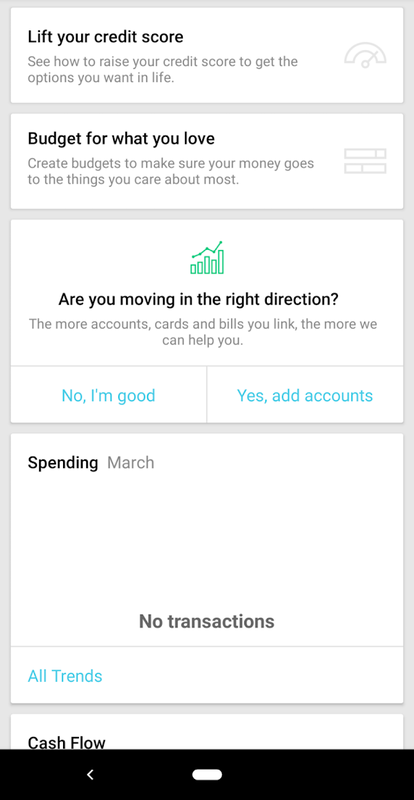 Even without the tour, though, Mint's mobile app is easy to navigate. The desktop web app has been simplified for mobile, and the main features are accessible through the bottom navigational tabs. Additional features can be found through a series of “cards” that explain the benefits of each feature, along with a simple icon to make identifying each card a little easier. Overall, the mobile app is intuitive and makes it easy for new users to get started. Mint's focus on education and building trust throughout their entire onboarding process provides positive momentum for new users—who may be justifiably wary about handing over their financial information to a third party—to receive value from the app, and take concrete steps towards better financial management. 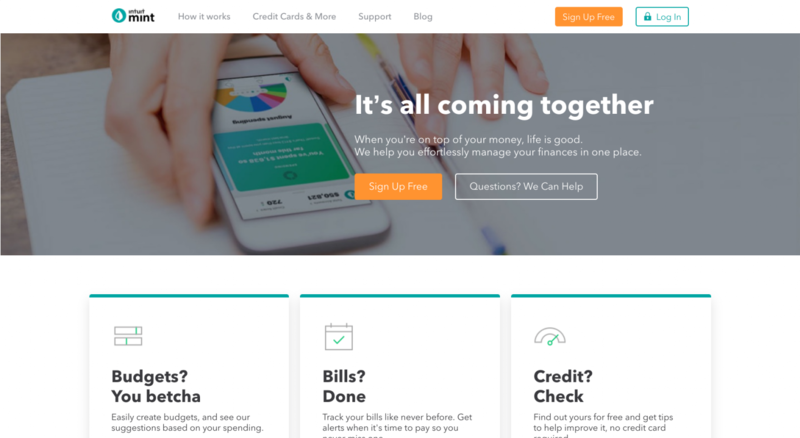 Check out our piece on Mint's Credit Score 101 for more ReallyGoodUX from Mint.